This article is about the anime arc. For the manga arc, see Duelist Kingdom (manga arc). 1: "The Heart of the Cards"
Story 1: Duelist Kingdom (Ｓｔｏｒｙ（ストーリー）１ 決闘者の王国（デュエリストキングダム） Sutōrī Ichi: Dyuerisuto Kingudamu) is the first arc of the Yu-Gi-Oh! anime. Yugi Muto is forced to take part in Maximillion Pegasus' Duelist Kingdom tournament in order to free the soul of his grandfather, after Pegasus' strips it from his body. His friend Joey Wheeler takes part too as he needs the prize money to pay for his sister's eye operation. The anime begins with Seto Kaiba kidnapping Yugi's grandfather and defeating him in a Duel order to acquire his rare four-of-a-kind card, "Blue-Eyes White Dragon". On doing so he tears up the card so it can't be used against him. Yugi then Duels Kaiba to get revenge. Not entirely conscious of the transformation, he switches to Yami Yugi for the Duel. Yugi learns that Kaiba possess the other three "Blue-Eyes White Dragon" cards as he Summons them. Yami starts to doubt he can win, but thinking of how his friends are supporting him in spirit, he manages to Summon the "Exodia", an instant win card combination. Yami then inflicts the Mind Crush Penalty Game on Kaiba, dispelling his evil side. Joey takes up learning Duel Monsters, but proves a weak player after losing to Téa and Yugi at school. Yugi agrees to help him improve and they start by watching the Japanese regional Duel Monsters tournament final at Yugi's house. The tournament ended with Weevil Underwood defeating Rex Raptor. As Weevil was congratulated by the creator of Duel Monsters, Maximillion Pegasus, he received an invitation to an upcoming tournament. After watching the finals, Yugi opened a package he received, containing a gauntlet, 2 Star Chips and a videotape. 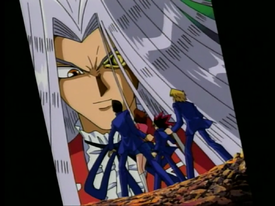 The tape contained a recording of Pegasus, who invited Yugi to Duel on the spot. Yugi switched to Yami Yugi, upon realizing that this was a Shadow Game. Pegasus won the Duel due to an imposed time limit and took the soul of Yugi's grandpa as Yugi's penalty. In order to get the soul of his grandpa back he accepts Pegasus' invitation to Duelist Kingdom and his friend(s) join him. With the exception of Pegasus beating Kaiba, as well as PaniK beating Mai, every time that there was a victor in a seen Duel, whoever was on the blue side of the arena was the victor. ↑ 2.0 2.1 Yu-Gi-Oh! episode 2: "The Gauntlet is Thrown"